Iain Duncan Smith, most well known, and most hated, by people in the UK who claim benefits – job seekers, child benefit, disability benefits, housing allowance (also known as LHA), working tax credit, the whole shebang – his department, the DWP (Department for Work and Pensions) and status means he is the decision maker in charge of reforming the previously, under the Labour government, generous welfare system in the United Kingdom. Some argue that the conservative party, currently in coalition with the Liberal Democrats, have gone too far with their Austerity (efficiency savings) and that people claiming benefits have had to bear the brunt of the aftermath of 2008, which general consensus points the finger of blame at Banksters (Also known as Bankers). The Conservative party are regarded as having gone a great deal further than necessary reforming benefits that have affected Disabled people, such as the now dubbed ‘Bedroom Tax’. Iain Duncan Smith is reportedly going to be rearing his balding head tomorrow, 11/08/2014, to make a speech about how his tough cutting on the benefits system has resulted in a lower level of unemployment. Proposed further cuts, going into the next General Election Manifesto, may see the Tories signal a desire to cap the benefits a family can receive at £18k instead of its current figure, standing at 26k, as well as limiting Child Benefit payments to two children, further enforcing the idea that if you can’t afford to have kids, don’t have them. Mr Smith is expected to insinuate that the welfare system was broken under Labour, and trapped people in a state of dependency, with working for a living often making a family with children poorer. IDS has often come under fire during his tenure as Department for Work and Pensions secretary, most ferociously for the reduction in housing benefits payable to someone with a spare bedroom, causing many political parties to say that if they are elected they will scrap it. With a lack of one bedroom housing in the UK it is a tough policy to tackle. Ideally, someone with a spare bedroom claiming benefits should look to rent that room out for additional income, yet disabled people have claimed that they need their spare bedroom in order to store equipment that helps them with their various ailments. While the idea has some merits, the draw backs appear to make it a policy that needs to be evolved or scrapped altogether. 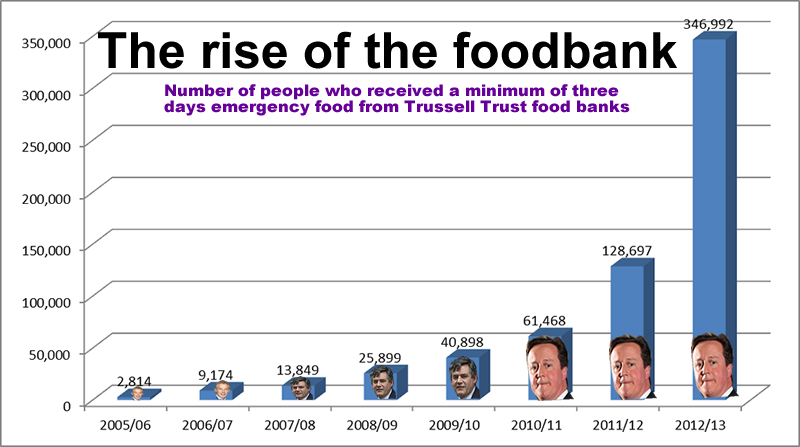 Increased usage of food banks under the coalition government. As a result of intense efficiency savings, the poorer in society have been hit the hardest. It is suggested that the economic crisis and deep reforms of the welfare system can be blamed for the increased strain on food banks, where single people and families go to get hold of cheap food so that they do not starve to death. Being the 6th largest economy in the world, food bank usage is a serious issue that needs to be tackled. Some political figures have argued that the slight increased notoriety of food banks has increased the usage even more so as a result of chancers looking to get hold of free food when they don’t really need, although this was met with criticism from people suggesting that most people in the UK are moral, decent people who often are too proud to take handouts even when they really do need them. This could suggest that the actual usage of food banks would increase further if everybody eligible was to use them. In addition to increased usage of food banks, short term finance companies, primarily catering for people with bad credit, have seen record profits as a result of the economic crisis emanating from 2008. Short term, high interest loan companies have seen applications increase ten fold and have loaned more money than ever before. Some say this is down to a reluctance by high street banks to lend to businesses and people who have slight blemishes on their credit history, others say it is down to the low earners in society who were either jobless claiming benefits or in work and using benefits to top up their part time job or low paying position in full time employment. This also brings about the question of why there are more people in part time work than ever before and whether the minimum wage is livable at a time when inflation has reduced peoples spending power. Benefits cap to be lowered by IDS and the Tory party.